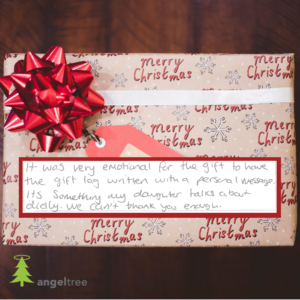 These five images contain quotes from the carers of children who received Angel Tree gifts. You are welcome to use them on social media, in church newsletters, or in any other context where you are promoting the work of Angel Tree and Prison Fellowship! Clicking the link will download a zip file containing five images. You will need to extract them from the zip file in order to use them (usually there is a button in the folder screen when it opens).